Nash equilibrium: How did the mathematical concept impact game theory and the world? Why Is the Nash Equilibrium So Important? Nobel Prize laureate John Forbes Nash in Beijing in 2005. Game theory is a study of strategies involved in complex games. Almost every human interaction—politics, economics, law, and religion—can be modeled as a game. You are in a game if your fate is impacted by the actions of others. There are many ways to classify the games. One such classification is whether the game is cooperative. Cooperative games are like partnerships where the players work together and contracts can be used for noncooperative players. Noncooperative games are those where the players enter into no agreement and each one is looking after his or her own interests. Think of Apple versus Google or U.S. versus Russia. They are playing a complex game. What John Forbes Nash Jr. said in his landmark work—“Equilibrium Points in N-Person Games”—is that even in such complex noncooperative games there exists an “equlibrium” where no side would benefit by changing its course. At this equilibrium, each sides knows its adversary very well and sticks to its strategy. For instance, during the Cold War, the U.S. and USSR were locked into an equilibrium—mutual assured destruction—where each side knew exactly where the other’s positions are but still didn’t start a war. Suppose my wife and I are trying to coordinate when to reach home. If I go home and she is late, then I waste time. If she goes home and I’m late, she wastes time. The Nash equilibrium occurs when both of us reach home early, enabling us to spend time together, or both of us work late, making more money. These two circle points are the Nash equilibria. This payoff matrix shows how many points each player gets if a particular strategy is taken. 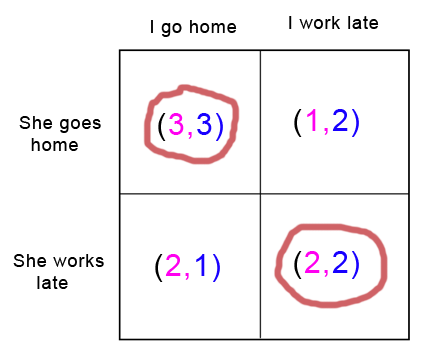 For instance, if a husband and wife both go home early (top-left quadrant), both get three points. If the husband works late and the wife goes home, the husband get two points, while the wife gets only one, as she is bored. By mathematically proving that there exists at least one such equilibrium point in any such game, Nash helped economists, politicians, bureaucrats, and business strategists understand the world around us in a better way. It formed the basis of many strategies we see around the world. It also indirectly showed how different players can dance to the tune even without the need for contracts. There can be multiple equilibria in a game. Each equilibrium point is like a lock out of which no player will be able to escape easily. For instance, India and Pakistan can fight each other like cats and dogs to infinity or an equilibrium where they can collaborate in a virtuous loop. When the players are locked into a bad position (such as an arms race), it is called the Pareto inferior equilibrium. To sum it up, the simplicity of Nash equilibrium enabled the growth of game theory as a legitimate discipline and enabled strategists and regulators to better model their environments. Equilibrium: How do you measure stability of an equilibrium? Nash Equilibrium:Do all problems have a Nash Equilibrium solution? Mechanism Design (game theory): Could the majority of society not being jerks ever be a Nash equilibrium?